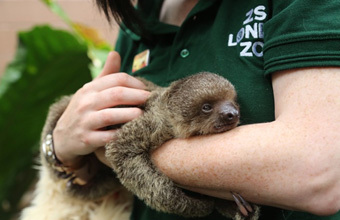 Zookeeper Kelly-Anne Kelleher, with the help of a special teddy-bear, has taken on the role of surrogate mum to ZSL London Zoo's newest arrival; a tiny baby sloth. The seven-week-old two-toed sloth (Choloepus didactylus), born to second-time parents Marilyn and Leander, needed a helping hand when his mum stopped producing milk, and was unable to care for her infant. Keepers have named the young male Edward after Johnny Depp's famous character, Edward Scissorhands, due to his impressive claws - which will grow up to four inches in length and enable him to cling on and climb easily through the tree-top branches of his Rainforest Life home. To help build up the muscles that Edward would normally use holding on to mum, keeper Kelly-Anne customised his sloth-teddy with carabiners so that it can be hung from a branch, enabling the youngster to climb on and strengthen his little limbs. The nocturnal mammals, native to South America, are notoriously slow, and baby Edward is no exception, with Kelly-Anne often having to wait for him to stir from a deep slumber before being able to feed him. Kelly-Anne said: "We're bottle-feeding Edward every three hours with goat's milk, topped up with some vitamins to keep him fit and healthy. "Just like with human baby formula, we heat it up until it's at room temperature, and test its warmth on our wrists - it took him a few days to get used to the bottle, but now he's hungrily suckling as soon as we give it to him. "If he's feeling particularly hungry he makes a very funny noise to let us know - a sound somewhere between a squeak and a sneeze, but it's very loud and he makes his point!" Keeping detailed records on everything the infant does, from eating to sleeping, zookeeper Kelly-Anne even logs Edward's potty-habits. Sloths leave their high tree-top habitats only once a week to go to the toilet, so by keeping track of his poop, Edward's keepers can account for any weight losses or gains. A valuable addition to the European breeding programme for his species, Edward's details will be added to the international studbook, which is shared with zoos around the world. Visit http://www.zsl.org to find out more.